Other P/N Labels: 0 0975700-02 HNW-3T72-SAS6-MRK-DD-HP 0975701-03 HNW-3T72-SAS6-CES2-DD-H.
Dell Tray Part #:JT4X5. 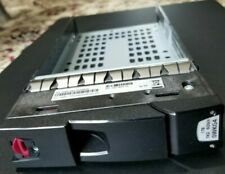 This is a tested working, used, clean,LOT OF 10, Dell Xyratex Data Domain 2TB 7K 3.5" Hard Drive Caddies/Trays with Screws and Xyratex SATA/SAS Interposer. Xyratex Interposer Part #:0930983-02. Includes screws. Genuine Xyratex Drive Caddy. Xyratex SAS Hard Drive ArrayHB-1235. Can be used as a JBOD for Dell, HP, Supermicro, etc servers. 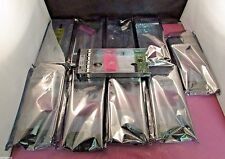 12 x 3TB SAS Hard drives (hitachiHUS723030ALS64. Boardroom Technologies will provide top level service and will do everything in our power to satisfy all your needs. ). Other P/N Labels: 0971823-03 HNW-1T72-SAS-CESP-DD-HP. HDD Caddies Only. Server is Not Included. The item up for sale is USED "Dell Xyratex 56193-07 3.5" Drive HDD Tray/Caddy 2007 Tested and Working ". Secondary functions not working properly or missing components are disclosed as follows I was able to test the latch and lock to be working. 10qty Xyratex SATA to SAS tray Interposer hard drive. Boardroom Technologies will provide top level service and will do everything in our power to satisfy all your needs. Other P/N Labels: 0975699-02 HNW-2T72-SAS6-MRK-DD-HP 0971824-03 HNW-2T72-SAS-CESP-DD-HP. Xyratex (Original) 56193 tray / caddy for mounting 3.5 SATA drives in Xyratex servers with SAS backplanes. An interposer is also required to adapt the drive to the backplane. Compatible with Xyratex RS-1220-E3-XPN Storage Arrays. Dell Tray Part #:JT4X5. 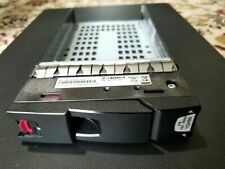 This is a tested working, used, clean, Dell Xyratex Data Domain 2TB 7K 3.5" Hard Drive Caddy/Tray with Screws and Xyratex SATA/SAS Interposer. Xyratex Interposer Part #:0930983-02. Model: HUA721010KLA330. Buffer Size 32 MB. Interface SATA 3Gb/s. Spindle Speed 7200 rpm. Device Type Hard drive - internal. Width 4 in. 1x Maxtor MaxLine Plus II 250GB HDD. 1x Intransa 73-0106-02 ATA Adapter Card 28-0007-02. All pictures are taken in house. stands to reason that issues will arise occasionally. We're eager to find an amicable solution when it does. 1x Seagate Baracuda ES 250GB HDD ST3250620NS. 1x Intransa 73-0109-00 PATA to SATA Converter Card 28-0013-00. All pictures are taken in house. stands to reason that issues will arise occasionally. We're eager to find an amicable solution when it does. Dell PN: 2P4N9 / 9YZ168-236. 1x Xyratex Caddy Tray withSATA interpose board which allows SATA drives to work in the array. Xyratex part number: 0955287-02, 0945845-03, 0973665-01, 0955287-02. 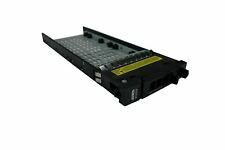 Xyratex 34905-03 3.5" Hard Drive Blank Tray / Caddy Dummy. Xyratex (Original) 34905-03 3.5" Hard Drive Blank Tray / Caddy Dummy - Used Pull. This is a 3.5 blank hard drive filler to be installed in Xyratex SAS/SATA/FC servers empty hard drive slots. Pulled from a working unit. Several units available. Products may show signs of normal wear and tear and may have missing parts, undiagnosed errors, blemishes, scratches, nicks or other deficiencies that do not interfere with the normal operation of the product. Manufacturer: Xyratex Part Number: 94023-03 Warranty: 6 Months Shipping: Free Fed Ex ground or USPS shipping. Xyratex (Original) 56193 tray / caddy for mounting 3.5 SATA drives in Xyratex RS-1220-E3-XPN servers with SAS backplanes. The 4-69241-02 interposer is also included to adapt the drive to the backplane. We do not provide technical support for set up, installation or any other use related issues. Therefore, we do not have record of item history or type of use. We are not responsible for compatibility issues with your system or software. (5X) Dell Compellent/ XYRATEX 1TB Fiber Channel Hard Drive Tray/Caddy lot. PN #95632-01. Assorted facia . Well working used units. These are trays/caddies only. Actual units in pictures. For those with Xyratex connections: P/N XYD-920146 F/C HN-300G-15K-7-SAS-DD. Part numbers for people with Xyratex connections: P/N XYD-920146 F/C HN-146G-15K-SAS-DD. Condition: used, in working order, like new condition. Other Notes of Interest. This Unit sold just like it is shown on the pictures. STOP – pls. We like WIN-WIN situations. Israel – pls. RS-36G10-U320-CH6-COMV36GB Ultra 320, 10K RPM, 80-Pin, Hot-Swap Hard Disk Drive, XYR P/N STOP – pls. We like WIN-WIN situations. Israel – pls. Manufacturer Xyratex. Note2: Genuine Part. Price is for one drive. Local pick up is available. Usage: Used. IBM Micro 1.8" RealSSD P400e 512GB 6Gb/s SATA SSD. XYRATEX Micro 1.9 SSD to PCI-e SAS/SATA Low Profile Adapter Board 0959303-07. XYRATEX SAS/SATA Connector Cable 0965486-01.